Hardy Process Solutions offers new swivel mount enclosures containing HI 6000 Series weight processors designed for harsh and heavy washdown environments. The robust design is made to withstand the most demanding industrial installations. Made in the U.S., using 16 gauge 304 stainless steel, the enclosure is rated for IP66/NEMA 4X environmental conditions and is delivered containing either a Hardy HI 6500-XP, HI 6500, or HI 6300 series weight processor. The large, high-contrast LCD display that makes the weight processors easy to view and simple to use is protected from impact by a thick polycarbonate window behind a watertight membrane in the stainless steel enclosure. The sealed tactile button cluster in the display eliminates accidental triggering caused by wipe-down sanitizing and harsh water-jet cleaning. 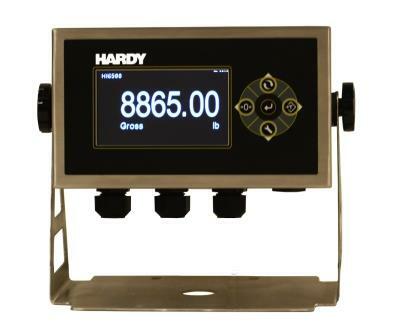 The HI 6000 series comes with Hardy’s Setup Wizard that guides users step-by-step through instrument set up and calibration. Use of Hardy’s C2 sensors for automatic system calibration and scale verification to save hours in commissioning and routine maintenance. Each instrument is UL and CE approved and available with power options of either DC or optionally AC. Each unit consumes just 5 watts nominal and 8.25 watts max, saving energy costs while driving up to 8 load points. Featuring an extra-large base, the swivel mount enclosure can be permanently mounted on both vertical and horizontal surfaces or simply left freestanding on a tabletop. The swivel mount base installs with just four mounting holes that match the company’s bench and floor scale pedestals, leaving plenty of solid surface area to drill a custom hole-pattern that suits any specific installation requirements.